Armand de Brignac is taking over Cristal as an affluent golden bubbly nectar in the pop culture scene in recent years. Probably after Jay-Z decided to boycott his once-long-time-favorite and declared to cleanse the Cristals from his clubs as well as personal life, the popularity of Cristal began to dip in rappers’ lyrics. Nevertheless, the prestige cuvee of Louis Roederer remained to be a highly celebrated champagne and a popular pick other than your Krugs and Dom Perignons. I was advised not to open a Cristal which has not been aged for 10 – 15 years and I found some truth to this statement after my first trial. The Cristal 2002 joined my champagne collection last year and sat quietly in the wine fridge for a year. Unexpectedly good in condition once opened. Golden lemon, with luring intense honey aromas and some lightly toasted nutty flavors. Strong acidity yet sophisticated. The sweetness from the fruit/honey flavors were very balanced by the acidity on the palate. But it’s seemed too young and it definitely feels like the wine could still last at least 10 to 15 more years. It’s drinkable now but I wouldn’t rate it as ‘good to drink now’ in my own standards, giving it some more time in the bottle is likely to give better results in the future. One has to be very careful to store the champagne as the bottle is crystal clear. Champagnes are very sensitive to lights while the clear bottle does not offer any UV protection for the wine. Best to purchase the ones that were kept in the original box. 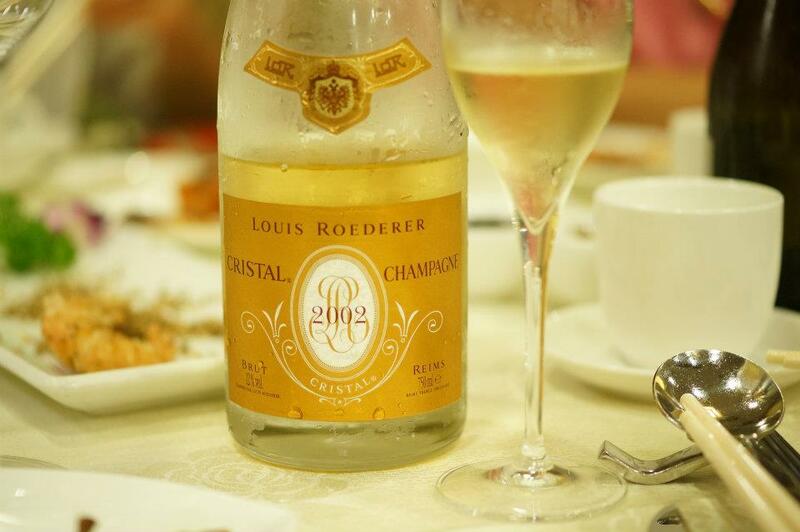 This entry was posted in Champagne and tagged cristal, louis roederer, Louis Roederer Cristal Brut 2002. Bookmark the permalink.